Note: We are pleased to reprint this paper on the Thai-Cambodia ruby and sapphire mines. It is one of the first Western accounts of the deposit. The Ruby and Sapphire Deposits of Moung Klung, Siam. By Henry Louis, A.R.S.M., F.I.C., F.G.S., M.A.I.M.E., etc. 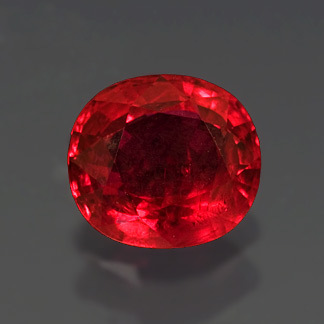 The following brief notes on the occurrence of these gems in one of the least known portions of the Siamese ruby fields may prove of interest, as the particular district to which they refer has very rarely, if ever, been visited before by any European, whilst nothing at all has ever been written on the subject as far as I am aware. The notes are chiefly extracts from my journal for the months of May and June 1892, which I venture to present with as little modification as possible, in the belief that a description written on the spot is likely to give a more correct and vivid, even although it be a less highly finished picture of the locality than can be attained by any subsequent elaboration. Moung Klung is a district or sub-province that lies between the two provinces of Chantabun [now Chanthaburi] and Krat [now Trat], on the western side of the first named. It is administered by a Governor who lives in the small fishing village of Ban Yao; he is in most respects subject to the Governor of Chantabun, the latter being a very intelligent man who speaks good English, having served for some time in the U.S. Navy. Map showing the deposits of Thai ruby and sapphire. 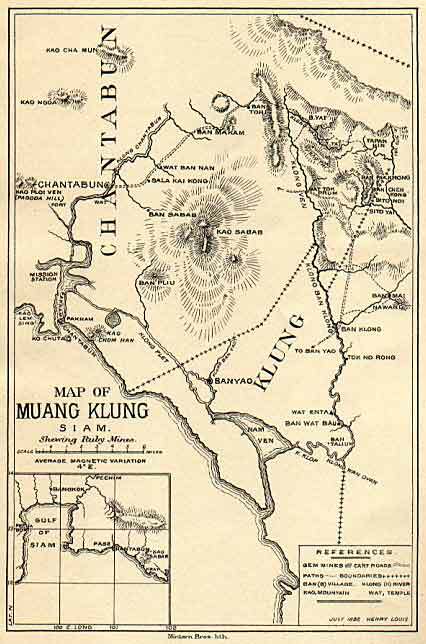 It would seem, accordingly, that up to the date at which this traveller visited Chantabun (1859) there had been no systematic ruby mining; he devotes much attention to the ethnology of the country, and yet amongst all the various races whom he describes as inhabiting this district he makes no mention at all of Burmese, although at present the whole of the gem mining of this country is practically in their hands. 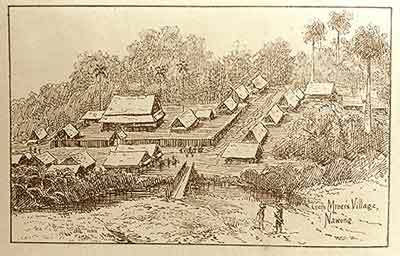 I therefore conclude that the Burmese can only have come into the country and commenced their mining operations within the last thirty years, and that the gems previously obtained were picked up by the natives on the surface of the ground, in water courses, shallow streams, &c., without their having carried on any such systematic working for them as they do now. There is regular steamer communication twice a week between Bangkok and Paknam Chantabun (the mouth of the Chantabun river) by means of small vessels of 100 to 150 tons burden, drawing about 9 feet of water, the journey taking about 18 hours, more or less, according to the season. A curious isolated mass of rock, called from its shape the Lion rock,1 marks the mouth of the river, whilst a signal station and a small fort occupy a prominent position on the summit of a high red bluff on the western side of the entrance. The Chantabun river is over a mile wide just inside its mouth, which is formed, however, by the confluence of several other rivers. The Chantabun proper is some 300 yards wide, and is very shallow, with flat sandy banks. A fair amount of traffic is carried on in this river by means of well built native boats, and there is even a small steamer which can ascend the river as far as the town of Chantabun at some seasons of the year. The town is a large flourishing place, and forms the market whither most of the native miners bring their gems for sale. There are also large coffee, pepper and rice plantations in the neighbourhood, and a good deal of jungle produce is also brought in, amongst which eagle-wood and various kinds of lac are the most important articles. Nevertheless the staple industry of the place appears to be gem mining, and upon this the bulk of the population, consisting of Siamese, Burmese, Shans, Chinese, Annamites, etc., appear to depend directly or indirectly for their means of livelihood. From Chantabun there are rough cart roads about 12 miles long leading to Ban Tohi and to Wat Tok Prum, from both of which places bad jungle tracks, say another 7 miles long, traverse practically the entire length of the ruby mining districts of Moung Klung, the centre of which is the small Burmese village of Ban Yat. Another route to this district from Chantabun is by boat, down the Chantabun river and thence through a regular network of creeks up the small stream called the Klong Ven to a small village called Ban Klong, whence a jungle track also leads to Wat Tok Prum. This part of the country is flat and open, the jungle on the river banks consisting mostly of bamboo. On leaving the river the country consists of a series of low undulations sparely wooded except in the hollows, till a small hill range known as Kao Tong, 900 feet above sea level, is reached. The hills here are covered with dense jungle, and, although not very elevated, the character of the country bears a decidedly mountainous aspect, apparently forming the foot hills of the large ranges to the north. Gem mining is confined to the valleys and the sides of these foot hills, and is there actively carried on by a population of some 200 men. The valleys are from 600 to 800 feet above sea level, whilst the hills that separate them are about 500 feet higher. All these valleys are traversed by small mountain streams, affluents of the river Ven, and the narrow patches of alluvial upon the banks of these streams form the gem mining areas, properly so called. In the upper portions of their course, these streams are too rapid to deposit any alluvial, but as the valleys open out a little and the speed of the streams decreases, patches of alluvial form, especially at the bends of the streams, and these patches, which are all of small extent and often very narrow, are the site of the operations of the gem miners. Gem mining is confined to the valleys and the sides of these foot hills, and is there actively carried on by a population of some 200 men. In addition to the gems occurring in the true alluvial, some are also obtained from the soil covering the lower portions of the flanks of the hills on either side of the stream. These latter deposits, being above flood level, are worked by the natives during the rainy season when the alluvial flats are under water. They are of comparatively small importance, and the others are always worked by preference when accessible. The gemmiferous ground of the hill workings appears to be the result of subaerial decomposition of the rocks composing the hills, due to the high temperature and excessive rainfall, rather than to fluviatile action such as has produced the alluvial gravel. The principal, if not the sole, constituent of these hill ranges is a trap rock; this rock, sometimes hard and sometimes decomposed into a soft brown clay, forms everywhere the bed rock upon which the alluvial deposits rest, and this same trap rock may be said to be the only component of the boulders that form the gravel, the base of the latter being a tenacious gray, brown or yellow clay, in all probability the product of the decomposition of the same rock. 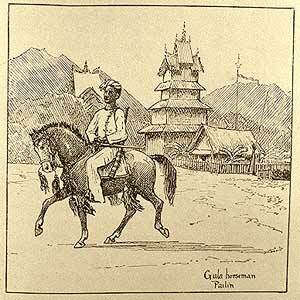 Gula (Shan) horseman in Pailin, Cambodia, an area famous for its sapphires. From Five Years in Siam by H. Warington Smyth, 1898. Besides the boulders of trap, most of which are well rounded in the deeper deposits and sub-angular in the shallow ones, a few boulders of white quartz are found, but only very sparingly. Quartz, transparent, in good crystals. It is only the first two minerals that possess any commercial value or that are sought for by the Burmese miners. In a number of trial pits which I sank to test the ground, the average proportion of the weight of rubies to that of sapphires was about as 2 to 1: the former are poor in colour, pale and of dull lustre, the latter mostly opaque and dull. The specific gravity of the former I found to be 3 979, and of the latter 3 974, the former being slightly the harder. The opaque corundum may almost be said to pass into sapphire for the most part. The zircon is of two varieties, one deep red and much rounded, the specific gravity of which I found to be 3 477, whilst the other is pale yellowish red of specific gravity 4 667; the latter often occurs in fragments showing faces of the prism and secondary pyramid. Both varieties become colourless on heating. The general character of the deposit is always more or less the same, although its depth varies in different places; the overburden consists always of clay, very sandy in the upper portions, but denser in the lower, varying from 2.5 to 12 feet in depth, whilst the depth of the pay gravel varies from 10 inches to 5 feet. Gem miners’ village at Nawong, Thailand. From Five Years in Siam by H. Warington Smyth, 1898. The Burmese method of working is very simple; small parties of three or four men working together sink a pit usually some 4 feet in diameter through the overburden, until the gemmiferous gravel is reached. They then take out the latter in baskets, leaving in place all boulders too largo to lift, but scraping carefully all round them down to bed rock, and working into the sides of the pit under the overburden as far as the nature of the ground admits. The gravel is carried in baskets down to the nearest creek, and piled up carefully in a curiously pointed conical heap until the pit is cleaned out, when washing commences. When the overburden is very deep, they use a very rude piece of machinery to hoist up the gravel and any water that they may meet with in working; it consists simply of a long pole pivoted on a short post driven into the ground. To the upper end of the pole is attached a basket or rough bucket by means of a length of rattan, whilst a big stone to act as a counterpoise is tied to the lower end of the pole. The washing is performed in a kind of pan or sieve made of thin strips of bamboo neatly plaited, and supported by a circular frame of bamboo about 1 inch deep, the diameter being between one and two feet; the bottom of this pan is very slightly concave, and is nice and smooth. The workman fills it with gravel and agitates it below the surface of the water so as to wash out the clay, and then works it up and down with a kind of jerking motion so as to throw the big stones to the top, and these after a rapid examination are thrown away. The smaller stuff is then worked about by means of a combined“jigging” and“vanning” motion, the pan being held sloping away from the operator. This throws the heavier stuff towards the washer, the lighter being thrown downwards. The heavy stuff is scraped off and put aside in a small cocoanut shell, any specially big gem being picked out. The lighter residue in the pan is then glanced at to see if it contain by accident any valuable stone, and is then thrown away. The heavy stuff is afterwards examined, picked over, and the gems picked out, sized and sorted. Valuable stones are scarcely ever found in this district, the production, although large, consisting of stones of very poor quality. The entire output, the result of the work of these 200 men, may be put down at between £2,000 and £3,000 per annum in value. The weight produced is perhaps not very far from half a million carats, including of course all the poor and almost worthless stuff. These latter data are, however, derived from statements made by the Burmese miners themselves, and are not therefore to be implicitly relied on. I nowhere found any of these gems in situ, nor have I ever heard of any being so found. Having regard, however, to the fact that their occurrence throughout this district is confined to the streams that descend from hills consisting mainly or entirely of trap rock, that the gravel in which they occur is composed only of clay (a decomposition product of the rock), and of boulders of the same, and rests upon a bed rock of the same material, I cannot reasonably doubt but that the trap rock must be the matrix within which these gems were originally formed, nor do I see any valid objection to the adoption of this theory, at any rate as a hypothesis, that requires either further proof or else confutation by subsequent discoveries. 1 I subsequently landed on this rock and found it to consist of softish pink and yellow shales dipping southwards; from their appearance I judge them to be of secondary age.